Do you want to help save mother earth? If so, then make consider making "green" choices when you purchase products large or small. 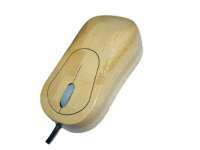 Here is a selection of products that use bamboo, from a computer mouse to a large screen television. Earth-friendly bamboo grows fast, needs neither fertilizer nor pesticides, sequesters a huge amount of the greenhouse gas, carbon monoxide, and creates more oxygen than a stand of trees. The bamboo plant doesn't die when canes are harvested, so there is no ugly clear-cutting, and erosion is prevented. When one thinks of bamboo products, inexpensive, and perhaps rather crudely made items from tropical third-world countries tend to come to mind. However, bamboo has come of age, and is being found in much more sophisticated products. 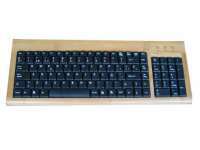 From playengine.co.uk come familiar household electronic items, sheathed not in the usual plastic, but in bamboo. 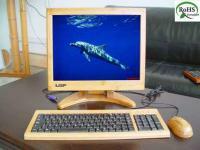 They offer a computer mouse, a computer keyboard, three sizes of computer LCD monitors, and last but not least, an LCD television. As PlayEngine notes, when describing their television, "Bamboo is a grass rather than wood, but it is harder than oak. The fibres are even stronger than wood and steel. The Bamboo used in these TVs is made from the Gramineae monocotyledonous plant. This type of plant is hard and panda friendly and as pandas only feed on soft bamboo there is no harm to wildlife. Once the bamboo is harvested it is dried in high temperatures which kills pests and bacteria. Then through high pressure and high temperature carbonization, the bamboo fibre and other compositions have been completely solidified." Unfortunately, these ecologically friendly products are currently available only in Great Britian, so the shipping prices probably would put these items out of reach for most U.S. readers. It's definitely something to be on the lookout for here in the States. In the meantime, you could always settle for the slightly less cool but still eco-friendly Durable Bamboo Office Chair Mat or All Bamboo Plates which are available in the US now. If you like this article, please take a look at the rest of InventorSpot.com. You may also enjoy our articles on Gadget Dos and Gadget Don'ts and Dirty Water ? Interested in ecologically friendly products, our Guest Blogger Tim Dunn lives near environmentally concious Seattle, Washington. Tim has diverse interests, as can be gathered from his websites, dunnanddunnrealtors.com, seattlemetrorealestate.blogspot.com, freerelationshipadvice.blogspot.com and steelsilhouettes.com. Portable Voice Lie Detector – No Lie!